Bring a large pot of water to a boil. 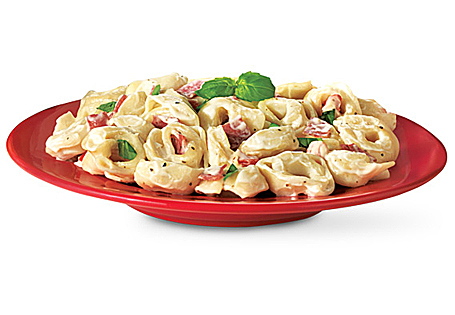 Cook tortellini according to package instructions. In a large skillet, heat 1 tablespoon of olive oil over medium-high heat. Add salami and sauté until crisp. Drain on a paper towel. Add tortellini and red peppers to skillet. Add garlic alfredo sauce and salami and cook until heated through. Top with basil.